As business owners know, the key to creating a successful business isn’t just having an unbeatable service or product. It also requires a solid reputation and the ability to draw in new customers. One of the easiest ways brick-and-mortar businesses can do this is by enhancing their curb appeal. As experts in commercial landscaping and lawn care, we know a thing or two about improving and maintaining properties. One of the biggest tips is not waiting until the spring to start preparing. The best way to ensure a beautiful lawn and landscaping in the spring is to give it some well-timed fall care. Below are some tips to maintain and improve your commercial landscaping. Fall clean up can be burdensome. Raking and bagging leaves can expend some serious time and energy. However, this is not a step you want to skip. Leaves block light and trap moisture, and are a sure way to have a dead lawn come spring. Mulch is a great way to protect the roots of young plants. It is also a great way to fight erosion. If you have yet to lay down a nice bed of mulch around key plants, now is the time to do so. Adding winter-hardy plants in the fall is a great way to give your business a splash of color during the dreary cold months of the year. Plants like daffodils, narcissi, and hyacinths are great to plant this time of year. Additionally, there are a number of benefits to planting in the fall, including extra root growth, less water usage, and spring-readiness. Until temperatures reach freezing, continue watering plants. This will help your plants get the moisture they need to survive the long winter. Aerating and fertilize your lawn before it freezes is a great landscaping investment. By giving it these extra nutrients now, you can ensure that you’ll have a lush, green, and healthy lawn come springtime. Fall in Northeast Ohio is a beautiful thing. However, this beauty doesn’t last long, and as all the firey leaves begin to fall from the trees, reality sets in: winter is coming. 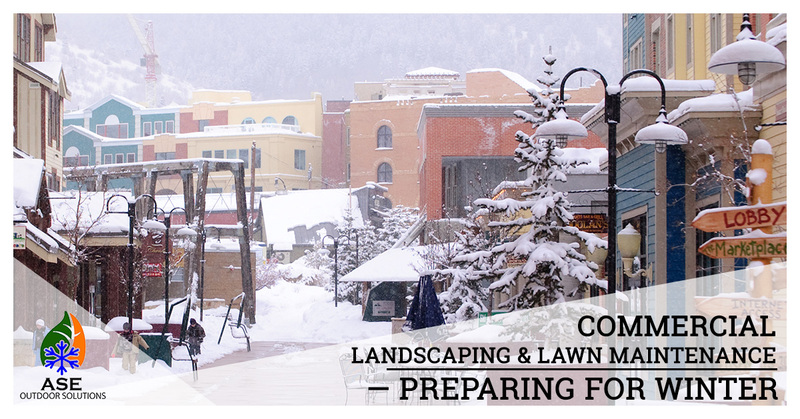 Whether you are a homeowner or business owner, are you prepared to handle all of your snow and ice removal? If not, now is the time to find a reliable snow removal company who will be there for you when the weather takes a turn for the worst. Learn more about our snow removal services and contact us today to book our services this winter.